Cliff diving is one of the least complicated extreme sports yet it can also be considered to be one of the most dangerous. In fact many tourism boards located in the most popular cliff diving locations refuse to promote the sport due to the level of danger that is associated with it. That being said, cliff diving can be great fun if you keep some cliff diving safety tips in mind. 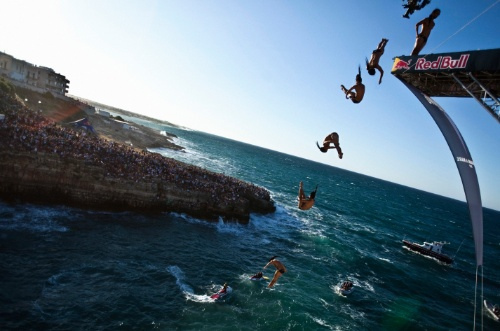 Why is Cliff Diving so Extreme? The main reason why cliff diving is an extreme sport is because of the major stresses that the impact of the dive can have on your body. This of course largely depends on the height you are diving from with the danger becoming greater as the cliffs become higher. If we take for example a cliff dive from around 6 meters (20 feet), by the time you hit the water you will be traveling at approximately 25mph. This is enough to give you a concussion, break bones or even compress your spine if you don’t get the landing just right. If you “belly flop” the possible problems could be even worse so make sure that if you decide to do any acrobatics that you do them as close to the beginning of the dive as possible. In addition to perfecting the landing you also need to make sure that the water you are diving into is safe. 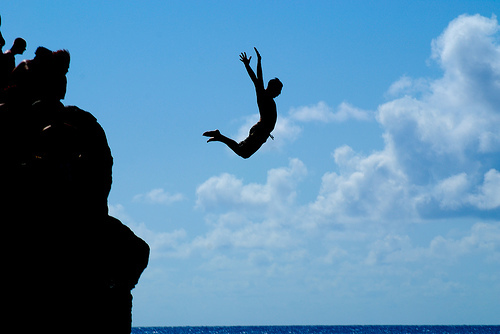 Obstacles without a doubt are the second main cause of injury and the main cause of death whilst cliff diving so it is paramount that you check out the sea below the cliff before you attempt to dive. Look for things such as rocks, branches and even fish and try and measure the depth of the water that you will be landing in. The World High Diving Federation recommends only diving into waters that are at least 15 meters (50 feet) deep if you are diving from a low cliff, and 30 meters (100 feet) deep if you are jumping from a height of 20 meters or more. Due to the risks associated with cliff diving, the World High Diving Federation recommends that all dives are kept to under 20 meters (65 feet) unless there is a professional rescue team waiting for divers in the water. 20 meters is an incredible height and whilst you may love the thrill that accompanies a cliff dive this high you would be best to start off small and work your way up. This way you can perfect your technique and know what your body’s limits are. Diving from a cliff higher than 20 meters could result in serious injury and possibly even death. Cliff diving competitions often involve divers diving from a height between 18 and 25 meters (60 to 85 feet) however it is not uncommon for true professionals to actually dive from heights that exceed 45 meters. To do this however requires a lot of training and it is not something that can be done successfully without it. Those who do dive at heights of 20 meters or above know the area that they are diving at inside and out. They understand the fluctuating wave and sea conditions and know what to expect when they hit the water. This still doesn’t prevent them from sustaining injuries however. 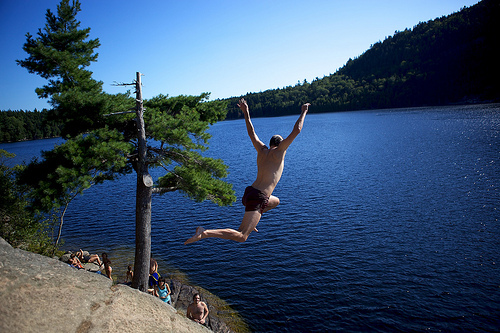 This entry was posted in Cliff Diving, Featured, Water Sports and tagged Cliff Diving, safety. Bookmark the permalink.